BOISE, Idaho, August 5, 2015 (ENS) – Wildfires are devastating western forests, forcing hundreds of evacuations and keeping thousands of firefighters working overtime. Last week’s blistering heatwave gave the fires an upper hand, but cooler weather since the weekend in the Pacific Northwest has given firefighters a slight advantage. The majority of the fire activity continues in California, Oregon and Washington, where hot and dry weather conditions continue to hamper firefighting efforts. Eight new large fires were reported today and one was contained. At least 465,991 acres are ablaze, according to the National Interagency Fire Center in Boise. Four MAFFS C-130 air tankers and support personnel from the California Air National Guard and the Colorado Springs, Air Force Reserve have been deployed to McClellan, California to support wildland fire suppression operations on the Rocky Fire, which is burning in dried out wine country and within the Berryessa Snow Mountain National Monument. The monument was just declared by President Barack Obama in July. 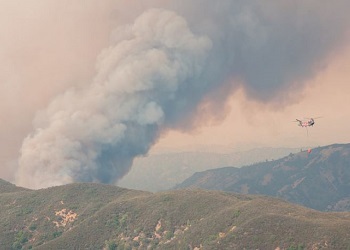 To date the Rocky Fire has consumed 68,300 acres and is 20 percent contained. Fire officials say 39 residences have been destroyed, and 6,959 structures are threatened. Evacuations have been ordered for a wide area around the blaze. Firefighters continue to work aggressively to build control lines and sustain perimeter control, officials report. The terrain is steep and rugged with limited access. Hotter drier conditions are expected to return today increasing the potential for fire activity throughout the fire area. The Rocky Fire is one of nearly two dozen wildfires burning across the state of California Sunday. Thursday, a South Dakota firefighter died while assisting the U.S. Forest Service in fighting the Frog Fire in nearby Adin, in Modoc County. California has been gripped by a severe drought since 2011, which has raised the wildfire risk. On Friday, Governor Jerry Brown declared a state of emergency. In Oregon, good progress was made Tuesday on the 17,166-acre Stouts Creek Fire, burning in rugged, densely forested country 16 miles east of Canyonville in Douglas County, Oregon. Hoses were being strung down the miles-long western flank of the fire and mop-up was underway in that part of the fire and along the northern edge. Crews on the east and south flanks were punching in fire line with bulldozers and other heavy equipment. In areas where equipment could not be used, fire line was being dug by crews. The Stouts Creek Fire is burning on private timberlands, Bureau of Land Management and Umpqua National Forest lands. The fire is 10 percent contained. Nearly 1,600 personnel are assigned to the fire, and crews are working day and night shifts. The cost of the fire suppression effort to date is $4.4 million. In Washington state, an entire small town in the path of a wildfire was evacuated Tuesday night. About 300 people from Roosevelt on the banks of the Columbia River, were forced to flee. State Route 14 was closed as the fire jumped the road.